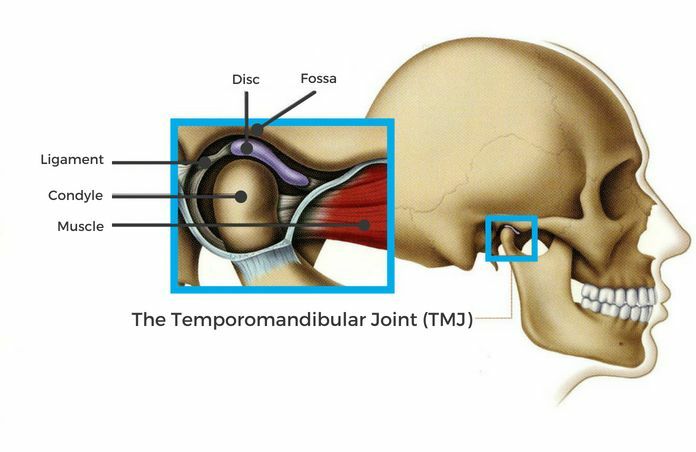 TMJ is the abbreviation for the temporomandibular joint. It connects the lower jaw (mandible) to the skull. There are 2 temporomandibular joints (one in front of each ear) that work together. They allow the movement of the lower jaw against the upper jaw (maxilla), so you can speak and eat. A range of diseases and disorders can affect the TMJ such as TMJ pain/dysfunction, disc displacement, and arthritis. Mandibular condyle: it is a bony structure that attached to the mandibular ramus by an elongated neck. A thin layer of fibrocartilage covers the mandibular condyle. Mandibular fossa: it is the joint socket. A thin layer of fibrocartilage covers the mandibular fossa. Articular disc: it is a fibrocartilaginous disc that divides the joint cavity into 2 sections. It is located between the condyle and the fossa. Joint capsule: the TMJ has a fibrous capsule that attached to the rim of the mandibular fossa and the neck of the condyle. The great mobility of the temporomandibular joint is made possible by the joint capsule which consists of elastic fibers and connective tissues. Ligaments: there are 3 ligaments that limit the movement and stabilize the TMJ. The temporomandibular joints allow the movement of the lower jaw against the upper jaw, so you can speak and eat. The temporomandibular joint is a complex joint system. It has a combination of 2 basic movements. These movements are termed rotation (the initial movement of the jaw when you open your mouth) and translation (gliding motion of the jaw as it is opened widely). The rotation occurs in the lower part of the joint and the translation occurs in the upper part of the joint. The right and left temporomandibular joints always work together. Open and close: the opening and closing of the mouth is a combination of rotational and translational movements. Forward and backward: no rotation occurs. The forward and backward movements of the lower jaw occur in the upper part of the joint. Side to side: it is also known as grinding movement. Simply, one condyle moves anteriorly while the other rotates around its vertical axis. TMJ pain/dysfunction: it is the most common TMJ disorder. It may occur due to muscle tension, teeth grinding, and arthritis. Disc displacement: the articular disc normally sits above the anterior aspect of the condyle. In the case of disc displacement, the disc moves out from its normal position (between the condyle and fossa) and interferes with the function of the joint. Also, it may cause pain and clicking or popping sound. Traumatic disorders: such as the dislocation of the mandible. Inflammatory disorders: such as myositis, capsulitis, and synovitis. Degenerative disorders: such as osteoarthritis and rheumatoid arthritis. Next articleHow Long Do Dental Implants Last? Fluoride Toothpaste: Why You Should Use It?